Summary: Shane Smiths host the news magazine series that covers provocative stories from around the world. There are a whole lot of “Holy s--t!” moments, but it’s very real and astoundingly raw--without once giving you the idea these are show-off correspondents with a makeup artist and clean clothes. It's graphic--disturbingly and, some would say, unnecessarily, so.... But it's also intelligent and enlightening. 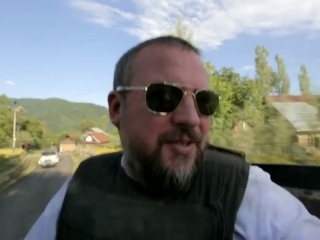 Despite showing some very gruesome imagery--a real decapitated head, for example--and having a swaggy, “we’re so hip we send our reporters into dangerous places looking like they just rolled out of bed” self-aggrandizement, Vice is fundamentally earnest. What Vice offers is not deep or thorough, but it is not without value. The news comes in pieces now; to get the full picture, you have to assemble it yourself. Vice tries to go where other news, documentary and magazine shows do not. That’s okay, though it does at times overstate its pioneering prowess. The problem with Vice isn’t its insistent aggrandizement but its excessive softheadedness. It’s journalism at the intersection of shallow and gullible, where they meet, high-five and compare tattoos. Fantastic all around. Gonzo journalism for the 21st century. It's not so much that VICE is handling issues that aren't covered by other newsFantastic all around. Gonzo journalism for the 21st century. It's not so much that VICE is handling issues that aren't covered by other news outlets. Rather, they're trying to do it more personally. They're less concerned with pinpoint accuracy, and more concerned with the human element that is buried within these harsh, often gritty, complicated political and cultural issues that they attempt to tackle. Everything VICE makes is one sided. They utilize their platform to spout whatever side they support. This only adds to the growing ignoranceEverything VICE makes is one sided. They utilize their platform to spout whatever side they support. This only adds to the growing ignorance of Americans, as it allows them to form opinions without hearing both sides. This applies to all of the seasons of vice, and the new show "Vice Does America"
As I watched Vice Does America I noticed how the crew framed and loved every Obama and Clinton supporter and fought every Trump supporter. The show claims "to travel the country and see what the political opinions of Americans are" yet they only support and favorable show half of the supporters while sh**ing on the other half. OK I've had it with this show and what they apparently call "news reporting". The special on cancer was interesting, admittedly, but sinceOK I've had it with this show and what they apparently call "news reporting". The special on cancer was interesting, admittedly, but since then every episode has been disappointing, to say the least. The show tries way too hard to be cool, with this "OH look at their problems over there, not my own right here", hipster mock/shock style of journalism that is. PLEASE Vice, if you're reading this, try sticking to REAL issues in America and the rest of the world, not this fabricated shock-for-ratings nonsense. For example, take your latest episode on China. "Everyone in China wants a white servant"?!! What a load of crap!! They do NOT want white servants, they want Chinese servants, because the service is much much better and there are no complaints while doing their jobs. One condescending scene after another... well, I lived and worked in there for 6 years, travelling all around the country, from corner to corner and everywhere in between, so I know a thing or two about the place. Instead of "reporting" on how "stupid" and "shallow" Chinese people are (actually, it is Chinese culture to be friendly to foreigners, to save "face"... thats all it really was), you should have focussed on the American losers who are taking advantage of a cultures friendliness, pretending to be "rock stars" (common phrase in China) and committing these fraudulent crimes. "Criminal bums from America, scamming in China"... "Westerners are at it again, ruining yet ANOTHER culture".. THAT is the real story. The funniest thing about that episode is that your team think they're SO clever, but in reality I can guarantee you the Chinese people were laughing at your ignorance, behind your backs of course (the "face" thing). Get a clue. My high hopes for this series have quickly turned into disgust and embarrassment for America. The short skits portrayed in this series areMy high hopes for this series have quickly turned into disgust and embarrassment for America. The short skits portrayed in this series are nothing more than exploitation's of other cultures and their apparent issues at hand. There is some truth to the matters at hand, but as an American that has lived in several of these places and experienced firsthand what is actually happening, I can safely say that this team of media investigators has embellished the truth on more than one occasion, as so many American so called "journalists" these days do. The majority of viewers have never and never will experience for themselves, which is why I must give this show a "0". It's a truly shameful portrayal of the usual cliches being touted in the news as "real" news, which it blatantly is not. Edgy it tries to be, edgy (once again) it fails at. Showing a few dead bodies laying around a street doesn't give you any "street" cred in my book. Just more exploitation of others in hopes of achieving some shock value ratings points. Interestingly, none of the skits (thus far) focus on America. We've got just as many, if not more, far worse problems, atrocities, corruption and misjustice happening daily in our own backyards. I'm inclined to believe the show could be much more informative, useful and believable (if not simply provable) if this were the case. I think it's pretty obvious why this show puts the focus on everyone else but our own society.